Pending home sales grew to 110.0 in September 2016. This is 2.4 percent higher than September 2015. It also indicates a 1.5 percent growth from August 2016. The 30-year fixed-rate mortgage (FRM) averaged 3.47 percent with an average 0.6 point for the week ending October 27, 2016. This is down 5 basis points from 3.52 percent last week. A year ago at this time, the 30-year FRM averaged 3.76 percent. 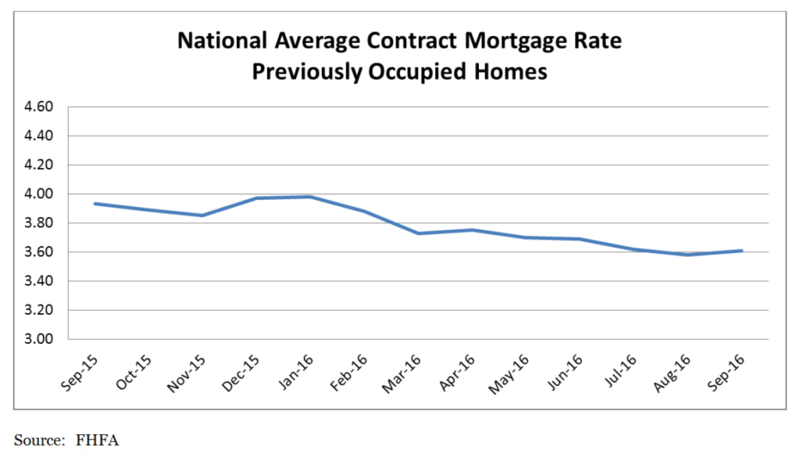 The National Average Contract Mortgage Rate for the Purchase of Previously Occupied Homes by Combined Lenders Index was 3.61 percent for loans closed in late September, up 3 basis points from 3.58 percent in August. The average interest rate on all mortgage loans was 3.60 percent, up 1 basis point from 3.59 in August. The average loan amount for all loans was $302,900 in September, down $19,800 from $322,700 in August. Mortgage applications decreased 4.1 percent from one week earlier for the week ending October 21, 2016. 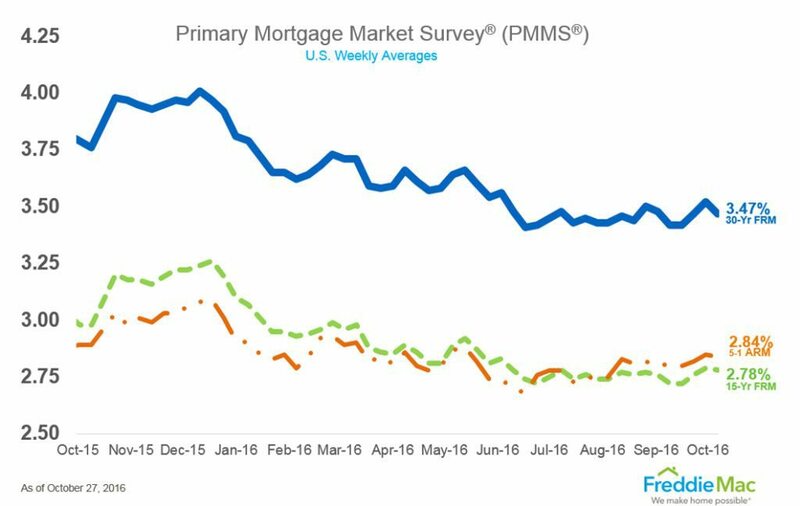 The refinance share of mortgage activity increased to 62.7 percent of total applications from 61.5 percent the previous week. The average contract interest rate for 30-year fixed-rate mortgages with conforming loan balances decreased to 3.71 percent from 3.73 percent. The national MiMi stands at 85.7. This is a 1.05 percent improvement from July to August. Year over year, the national MiMi improved 5.44 percent. Sales of new single-family houses in September 2016 were at a seasonally adjusted annual rate of 593,000. This is 3.1 percent above the revised August rate of 575,000 and 29.8 percent above the September 2015 estimate. The median sales price of new houses sold in September 2016 was $313,500; the average sales price was $377,700.